When I ride my bike to Santa Cruz, or just into the mountains, I normally head through the so-called Patchen Pass (aka the Summit area) just south of Los Gatos. But since I live in the Almaden area, there's a somewhat less popular option available: Hecker Pass. 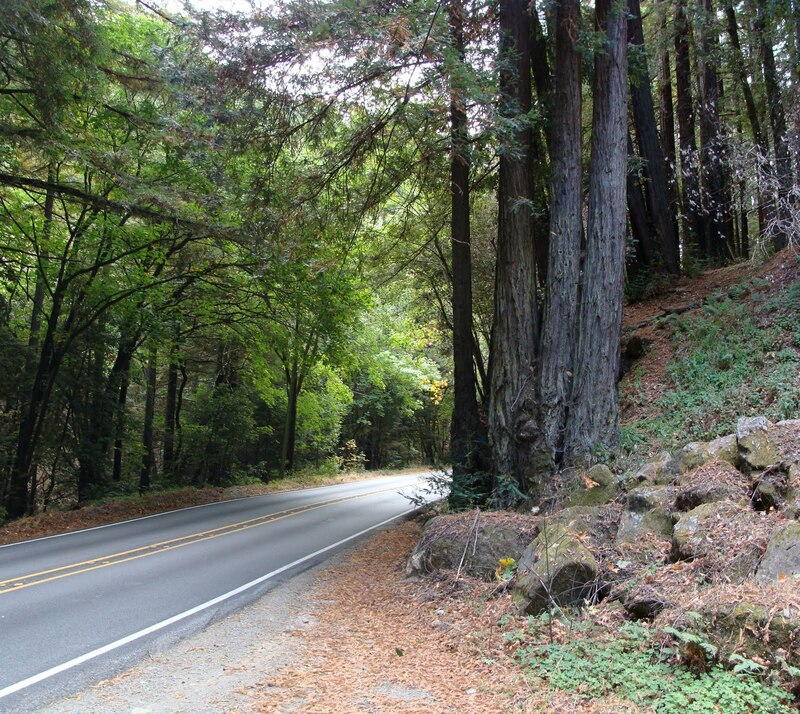 The Hecker Pass Highway, or Route 152, links Gilroy with Watsonville across the southern end of the Santa Cruz mountains. It has a poor reputation as a road for bicycling, but it's hard to know how to take that, since some bicyclists are just uncomfortable around traffic. My only experience with Hecker Pass was a sightseeing drive I took several years ago, and I remembered it as a twisty, narrow road. I started out about 8:30 AM yesterday. The fog was burning off as I went down the Almaden Expressway to McKean, which turns into Uvas Road. It was nonetheless a cool, beautiful day for a ride, and this opinion was apparently shared by the dozens of riders out there with me. Today was a day for club rides, which meant riders passed me in ones and twos on the hills, and then in large groups on the flats. It was on Uvas Road that I saw the day's closest encounter between a car and a bike. One of the club riders was just ahead of me and a champagne-colored Cadillac brushed by a few inches from him. From my vantage point I was sure he was hit. No oncoming traffic; it just looked like the Cadillac didn't feel like moving over. The last time I came down here I explored all the side roads, so this time I was a little surprised to find myself down by the Uvas Reservoir after only 20 miles of riding. I took a right on Watsonville Road, stopped at the Chitactac Park to top off my water, and then paused at the intersection of Watsonville and 152 to eat a few bites of a Clif food pellet. When I got back on the bike, I heard something that sounded like an out-of-tune banjo; sure enough, I had broken a spoke on my rear wheel. No idea how that happened. The wheel was a couple of millimeters out of true, and might get a lot worse. I was near enough to Gilroy that I could probably find a bike shop, or I could call it a day. Or none of the above: I opened my brakes all the way (who needs rear brakes anyway?) and continued on, up the Hecker Pass Highway. The first mile or so of Route 152 passes through the typical vineyards and farms of the area. Right at the turnoff for Sprig Lake, it changes character entirely. Most noticably, the sparse trees give way to full, deep, enclosing woods. The grade also increases distinctly, although it's still mild. The road, I must say, is not a bicycle road. Aside from the rare turn-off area, the shoulder is a consistent 6 inches, all the way up (the shoulder shown in the photo is typical). On the positive side, I don't recall any stretches with no shoulder at all, or especially skinny lanes. There was a fair amount of traffic; I'm guessing I got passed by a hundred or so cars. I had no close calls, honking or other drama. This is all actually OK for me, but if you're ever uncomfortable on roads, you should probably find an alternative. The road climbs to Hecker Pass at 1309 feet, as the sign tells us. The plaque in the background tells us that the pass is named for Henry Hecker, who advocated the construction of the road in the 1920s. It turns out he was a Santa Clara County Supervisor for the Gilroy area, and wanted a road from Gilroy to the sea without having to go all the way down to Route 129 a few miles south. OK Hank, you got it. Just beyond the marker is something called the Mt Madonna Inn. 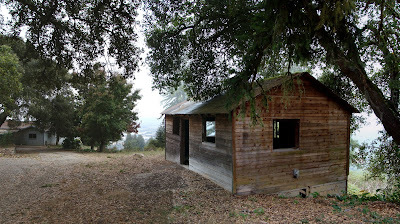 There was also a path leading toward a great view of Watsonville, near some decaying cabins. Mt Madonna Inn looks like it's being rennovated, and with any luck it'll match it's heyday in the 1970s. Here at the peak is also the intersection with Pole Line Road, the main entrance to Mt. Madonna Park. I decided to head up through the park to enjoy the scenery. Pole Line Road is short but quite steep, especially in contrast with the mild grade of Route 152. 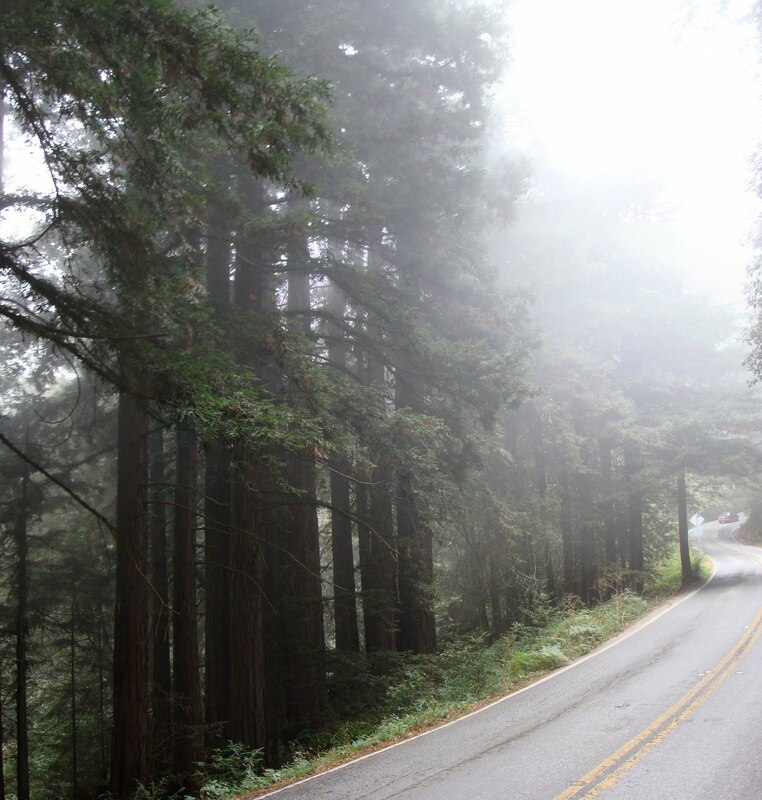 The fog was still thick on Mount Madonna, visibly rolling over the trees onto the road. It was condensing in the trees and then dripping, creating a reverse-rain effect: wet under the tree canopy, but dry elsewhere. I rode through the park and my legs were really starting to feel tired. Well, there would be a lot of downhill on which to recharge, at least. At the four-way intersection on the other side of the park, I went the only direction I had never been before: Mt. Madonna Road. Mt Madonna Road is a twisty, one-lane, not-recently-paved road. It seemed pretty steep. The rough pavement combined with my fat keister could result in a lot of energy hitting my wheels, and with my broken spoke that could lead to additional deformation. Of the wheel, not my keister. So I was a little cautious on the descent. By this point it was about noon, and my target was lunch at the Corralitos Market. At the bottom of Mt Madonna Road I took a right onto Hazel Dell Road, which runs through the woods, climbs a bit of a hill, and at some point turns into Brown Valley Road. Brown Valley Road runs right to the market. There were dozens of cars parked up the road from the market, apparently for some sort of reunion. My legs were awfully sore, and I still had to get back over the mountain to get home. So I took my time eating lunch. I got back on the bike and slowly headed up Eureka Canyon Road, feeling very weak on the climbs. Eventually I got to the intersection with Buzzard Lagoon Road, where Eureka Canyon turns into Highland. This is a high point in the road at nearly 1900 feet. Highland immediately drops about 300 feet before climbing right back up to 1900 feet very near the site of this spring's mudslide. This was the peak of this ride. After this high point Highland wiggles along, mostly level, then drops 200 feet or so to meet Summit. I stopped at the Summit Store for a drink, then went down Old Santa Cruz Highway to Los Gatos, and finally over Blossom Hill Road toward my house. After a day on Uvas Road and Hecker Pass Highway and all sorts of one-lane roads, it was here on Blossom Hill Road that I had my closest encounter with a car. And not on the skinny part of the road thats heads over the hill, either -- it was east of that, on the four lane road with generous parking lanes. The car was following an SUV pretty closely, so they probably never even saw me. The suburbs are murder. The ride was a little over 76 miles, which is awfully long for me. The Garmin gave me 5800 feet of climbing, although the real number of probably closer to 4500. Still, the Garmin result shows the value of the elevation correction done by the Garmin Connect web site. Out on the road the elevation reading was a random number generator, fluctuating by 100s of feet on steady climbs. The raw data, with the elevation correction turned off, gave me 14000 feet of climbing. I suspect the estimate of calories burned is based on the raw data, because it thought I burned 12000 calories. If I had done that, I'd be dead. Today was a great ride. It was my longest ride in years, and one of the few times I've managed to cross the mountains over and back. I'm getting to the point where I can get a little more ambitious in my routes. My options are expanding. Yesterday I rode to Laurel, a town that shows up on most maps of the Santa Cruz mountains but doesn't exist. When they built a rail line between San Jose and Santa Cruz, they dug tunnels through some of the ridges to keep the grade manageable. One tunnel ran through the Summit ridge, from Wright's Station to Laurel. Then another tunnel ran from Laurel to Glenwood, through the ridge that Highway 17 now runs across. Little towns sprung up at each of these entrances, born to serve the tunnel workers and then sustained by train traffic. But as the railway declined and disappeared, so did these towns. Wright's Station, Laurel and Glenwood are all ghost towns. I left the house about 9 in the morning. 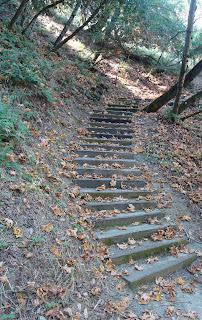 I warmed up the legs by taking Shannon across to Los Gatos, then took the Los Gatos Creek Trail up to the reservoir. For the second time in a row, I spun my skinny tires on the dusty ramp at the end of the trail and had to walk up. Part of the problem is that it's late in the dry season, but another part is that there's really only one solid line, and if the trail's busy you end up in the dust. At the top of the dam, the parking lot at Lexington Reservoir was overflowing with cars. I have no idea why. As I rode around the reservoir on Alma Bridge Road, there were also cars in each of the turnouts by the side of the road, near the trails. Could it have been the Coast Cleanup Day? If you have this, why do you need Highway 17? At the southern end of the reservoir, I took Old Santa Cruz Highway and climbed up to Summit. For the first time, I went straight across. Until now I've only seen the northern section of the road, which is a lightly-used but normally maintained asphalt road. The southern portion still has its original concrete surface from the 1920s, and looks like it hasn't seen much work since then. Despite the many cracks and occasional asphalt patches, you can almost see ghosts of Nashes and Packards puttering along on skinny spoked wheels. Now, like many of the old roads in these mountains, this one has been ceded to bicycles. This part of the road runs about a mile, basically level, until it meets up with Highway 17. I suspect that the old highway ran along the same route until it met up with Glenwood Drive, somewhere. I turned around at the highway, the high point of this ride, and headed back to the intersection with Schulties Road. There was a permanent sign at the intersection indicating that the road was closed, which can't be good news. The reminder that there's no turn-around is amusing, and a good sign to take seriously if you're driving around here. Intersection of Schulties and Old Santa Cruz Highway. You can't say they didn't warn you. Schulties runs through thick woods, down a steep-sided gulch formed by Burns Creek. It drops from about 1600 feet to 800 feet, and its quality drops along the way. It starts out with smooth asphalt, and toward the bottom it's so broken up and gravelly that it's not clear whether it's paved at all. The road has become feral. Toward the bottom of a very slow descent, I came across the construction that closed the road. This wasn't some pothole; apparently the whole road has washed away, and is in the process of being rebuilt. I had a hard time finding a path to even carry my bike through the work zone. the shadows to the left. A little further down one arrives at the intersection of Schulties, Redwood Lodge Road, and Laurel Road. This, apparently, is the former location of the town of Laurel. Today there are a couple of houses and a historical marker. I'd love to look around the tunnel entrance a bit, but it's at the end of a private driveway, right next to one of the houses. And yesterday two big dogs were barking at me as I took pictures. I knew the tunnel entrance was back there somewhere, but I couldn't see it, let alone get a picture of it. Now, there are two old tunnel entrances near Laurel. This tunnel ran to Glenwood. The other one ran to Wright's, and this side of it was actually back up the road a bit -- I had missed it. I knew the entrance would be on my left, but I had imagined that it would be near the road. In fact, it must be across the creek. I'll have to try again. If you look at a terrain map it's pretty obvious where the entrance should be, so I'll just have to keep my eyes peeled. My plan was to ride up Redwood Lodge Road. Schulties had dropped more than I expected, so I was amused to find that Redwood Lodge dropped another 100 feet to about 800 feet as it crossed back over Burns Creek. I was worried that Redwood Lodge might be steep, but as it turned out I motored on up in a way entirely unlike me. Redwood Lodge is a single-lane road, with more traffic than you might expect. 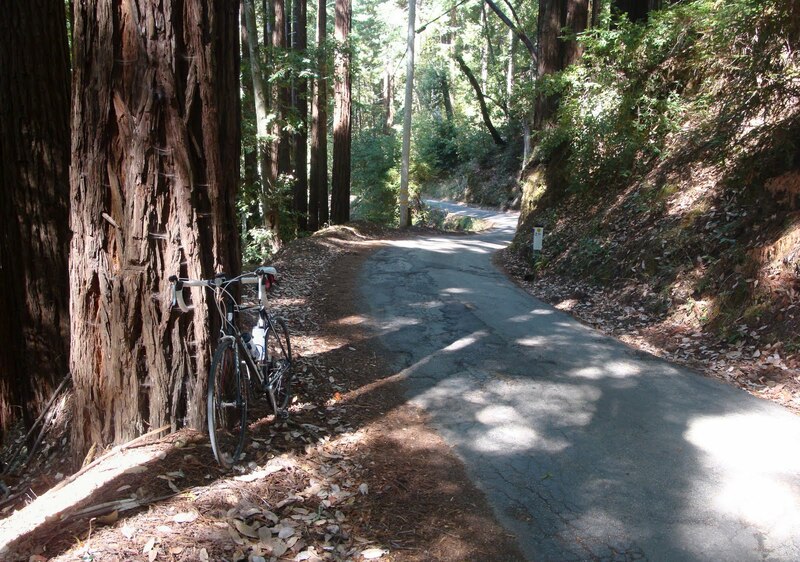 Redwood Lodge meets the Soquel/San Jose road at a little over 1300 feet. I took a left, riding up toward Summit Road. I had been seeing enigmatic signs reading "Goat Hill" around the Summit area. I was assuming it was a bike thing, but there wasn't a clue. On Soquel/San Jose there were more signs, and around Summit Woods Drive there were dozens of cars. Apparently the signs referred to something called the Goat Hill Fair, and it was fairly popular. Since it was now a little past lunchtime I stopped at the Summit Store for half a sandwich, then continued down Summit back to Old Santa Cruz Highway. This time I went around the west side of the reservoir, which incidentally follows the other remaining part of Old Santa Cruz Highway. So yesterday I rode the whole thing. Apparently, the part of this road that parallels Highway 17 is relatively new. If you look at Google Earth images from the early1990s, Old Santa Cruz Highway just meets up with 17, so for bicyclists it was like the section between the Bear Creek overpass and Alma Bridge Road. Still feeling reasonably good, I crossed back over to Almaden on Kennedy. The Garmin reported a little over 45 miles, but its elevation readings in the gulch pretty much went nuts -- it recorded some 8000 feet of elevation, on a ride that never went above 1800 feet. The real number was probably below 3000 feet of climbing. A while back I rode my bike to Felton, with the idea that I'd take Mountain Charlie Road back home. In the event, I tuckered out and had to call for a ride. Yesterday, confronted by a beautiful day and strangely motivated by watching the Vuelta a Espana climb the comically steep Angliru, I decided to try again. This time I hedged my bet considerably by driving to the Lexington Reservoir. This cuts 8 miles off the front and end of the ride, and eliminates a good 600 feet of climbing. I very much prefer to ride from my house, but on the other hand I've never crossed over the Santa Cruz Mountains and then made it back. 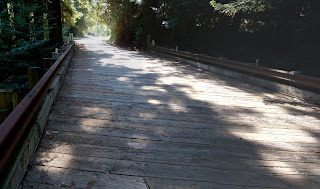 So I drove to the end of the Old Santa Cruz Highway, to the parking area near the Bear Creek Road overpass. What with watching the Vuelta stage and being generally lethargic, I didn't get started until about 10. The sun was out in Los Gatos but it was still cool as I climbed up the Old Santa Cruz Highway to Summit Road. I took the left, and for the first time I can recall I had no excuse to stop at the Summit Store, so I zipped past and headed down the Soquel/San Jose Road toward Capitola. from the Soquel/San Jose Road. In retrospect, this ride touched on a great deal of the history of the roads between San Jose and Santa Cruz. The Soquel/San Jose Road, for example, approximates the route of the old San Jose Turnpike, which was built in 1863 to compete with Mountain Charlie Road. But I get ahead of myself. The Soquel/San Jose Road drops off the ridge on nice pavement with wide turns. It would be a great ride except that it lacks shoulders and has considerable traffic. It falls for about 6 miles, then runs for another 5 flatter miles into Capitola. 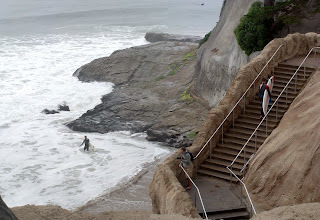 As I rode into Capitola, I went from sunny skies into a gray mist near the ocean. The whole oceanfront was pleasantly busy as I rode along Cliff Drive. In particular there were a lot of surfers in the water -- I'd guess at least 100, and several times that number milling about on the beach and on the road. As it turns out, that was probably due to the surf being unusually high due to a Pacific storm. This ride along the beach was a little reward to myself. I had a good time watching the surfers and the surrounding crowds. It was a completely different in every way from the rest of the ride -- cloudy, crowded, and cool, where the rest of the ride was sunny, solitary and sweaty. Those major differences in environment give a sense of scale to the ride; when you're riding through thick forests later on, the time at the beach seems a lifetime ago. By this time it was about 1 PM, and my thoughts turned to lunch. I had some food pellets with me, but with the whole of the waterfront available I was sure I could do better. As I rode on Murray Street I passed a place called Betty Burgers. Burgers, open tables outside, perfect. I had a great burger, sitting outside in the emerging sun to ward off the 57-degree temperatures. Fully loaded, I set off on the return trip. Following some wise advice I rode up the San Lorenzo river path to its end at the Cabrillo Highway, then took Plymouth to Emeline, under Route 1, and back to Plymouth, which turns into El Rancho and parallels I-17. After the leisurely lunch and long, cool, slow ride through town, I found the short ramps on El Rancho the most difficult climbs of the day. El Rancho turns into Mt. Hermon Road as it crosses I-17 into Scotts Valley. I stopped at a gas station to fill up my water bottles, then headed north on Scotts Valley Drive. Where Mt. Hermon is like a highway rest stop, full of national chains and oriented toward cars, Scotts Valley Drive has the feel of the main drag through a small town. Scotts Valley Drive meets up with Glenwood Drive, which begins a gentle climb. Apparently Glenwood Drive was the main highway between Los Gatos and Santa Cruz from 1916 through 1934, when the highway was realigned toward the current Highway 17. Glenwood Drive is a very pretty road, and a gentle climb. It meets Mountain Charlie Road at about 900 feet of elevation. I knew that, very near the intersection, there was a disused tunnel entrance, but as I passed through I missed it. Let's talk a bit about the history of Mountain Charlie Road. If you look at the history of the Bay Area, you could be forgiven for thinking that the world was created in 1848. Before that there were thousands of years of Indian inhabitants, but little change. There were decades of Spanish missions and sprawling Mexican ranchos, but the Mexican population was tiny and their lasting impact on the area was minimal. Throughout this time roads were used mostly for communication -- people waking or riding from mission to mission, for example. Think: single track. But then came the American expansion, driven by the discovery of gold, and commerce. Commerce means wagons full of stuff to sell, and that requires wider and flatter roads. Initially road building was itself a commercial venture, and before too long we had Zacharias Jones' road, the Mountain Charlie Road, and the San Jose Turnpike. Eventually these roads would be purchased by the county and made public, and as time went by they were replaced by increasingly level and direct routes. Mountain Charlie himself was born Charles McKiernan in Ireland, and arrived in the area as a "forty-niner", shortly after the discovery of gold. A few years later he settled in the Summit area, ranching and killing off the grizzly bears that were plentiful in those days, but threatened ranchers. His legend was born when a bear turned the tables and made off with part of his forehead. Mountain Charlie died in 1892, and his road is beginning to show signs of wear. It's a one-lane road all the way up, serving sparse houses along the way. The pavement near the bottom is especially rough (I wouldn't want to come down this way), and there are patches of sand and gravel throughout. The lower parts of the road head steadily up at a moderate grade. It runs through a heavily wooded area punctuated by occasional houses (including one modeled on a submarine). Once you get to about 1300 feet, somewhere near Old Japanese Road, you start seeing steep pitches followed by level sections. On one of those pitches, standing on the pedals, I spun out on a sand patch. 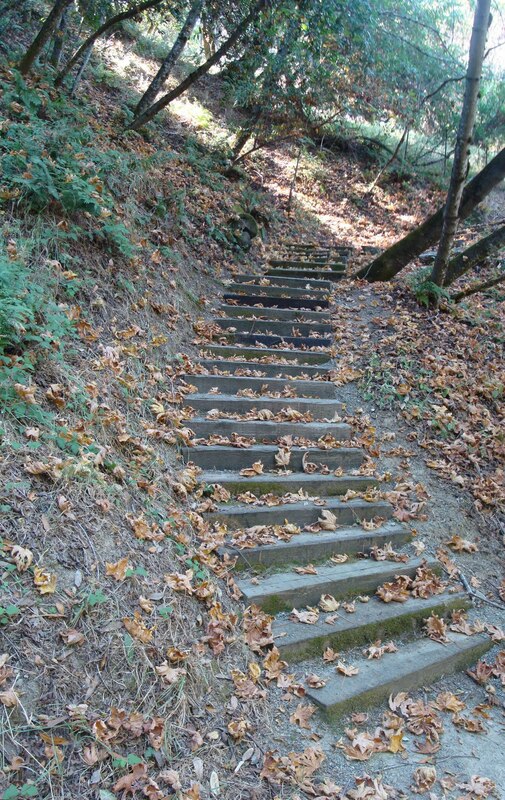 I guess it couldn't have been too steep, though, because I was able to resume. Mountain Charlie runs sporadically along a ridge that gives you alternating views east and west. After Riva Ridge Road, Mountain Charlie Road flattens out, running through heavily shaded woods to Summit. The silence is broken only by the incredible roar of nearby Highway 17. I knew that somewhere along here I must be going by the site of Mountain Charlie's cabin and site of his fight with the bear, both marked with historical markers. I missed 'em both. I'll have to catch them the next time. When I got to Summit, I could have crossed Highway 17 and then down the other part of Mountain Charlie Road. But I wanted to try riding through Redwood Estates instead, which meant turning left on Summit and climbing another 200 feet. Houses in Redwood Estates are perched irregularly on the hillside cheek by jowl, as the terrain allows. They are served by a confusing network of steep, serpentine single-lane roads. Actually, the roads only look confusing on a map; once I turned off of Summit into Redwood Estates on Woolaroc Drive, it always seemed pretty obvious which way I should go. All the roads are skinny and steep, and with lots of people out and about, I was hard on the brakes the whole way. I stopped briefly at the store near the bottom of Redwood Estates, then dropped down the last hill to Holy City, on the Old Santa Cruz Highway. From there it was a short fast trip back to the car. So now I've almost made it over and back again. At the end of the ride the Garmin read 47 miles and some 4600 feet of climbing, which probably should have been closer to 3200. By starting at the reservoir I had cut out 600 (real) feet of climbing, which is a large percentage of the total. I don't know whether I would have made it from home, but I'm close, and getting closer. Elevation profile and 100-meter grades.